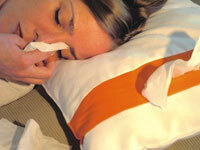 Kleenex Pillow: Let It Out. "What's with all these Kleenexes in the bed?" "Oh, when I said that your sister was hotter than you, and when I first asked you out over the phone it was actually a mistake...that I later regretted?" "No, the other night when you said my cancer was karma punishing me and rehab doesn't excuse me forgetting the milk." "So I invented a pillow and I'm leaving."